Hungarian scholar; born in Presburg about 1777; died there on the second day of the Feast of Weeks, 1845. He was shoḥeṭ and teacher in his native city for more than forty years. He wrote ten works, of which the following, some in German with Hebrew characters, and some partly in Hebrew, were published: "Megillat Matityahu," Vienna, 1806, 1822; "Maḥeh Mosheh," an allegory after the Talmud and the Midrash, Presburg, 1834; "Maḥaneh Yisrael," observances for Jewish women, together with moral precepts from the Talmud, Vienna, 1816; "Maḥaneh Yissakar," ib. 1822; "Ḥuṭ ha-Meshullash," regulations for Shema', ẓiẓit, and tefillin, ib. 1829; "Maḥaneh Levi," Prague, 1827. The last three are compilations of "dinim." 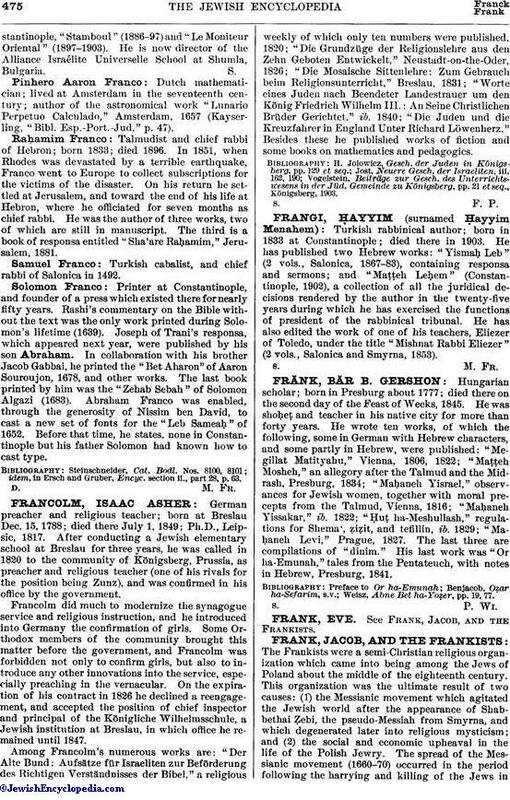 His last work was "Or ha-Emunah," tales from the Pentateuch, with notes in Hebrew, Presburg, 1841. Weisz, Abne Bet ha-Yoḥer, pp. 19, 77.